I accidentally appear to have had a week off blogging this week. I had the week off work too, I started my new job last week and lets just say that by the end of it I was glad I had this week booked as leave, I just didn't want to do anything, you know those times? I don't think the situation was helped by my coming down with a sudden cold last saturday. I initially thought it was allergies, but it didn't shift once I left the vicinity of the animals so I have come to the conclusion that it is rather more, and it is still hanging around. If you follow me on Instagram you will know that there has been no rest for me to recover as I made another car cake this week for my other half's birthday. This year it was a little less to my ideal standards but it passed the test and apparently tastes delicious so there were smiles all round. Anyway, update aside, this week I also received a few packages filled with skincare. Do all of your skincare bits run out all at the same time or is it just me? I mean exactly at the same time too, skincare always seems to need ordering all in one go, i needed day cream, toner, eye cream and make-up remover, and I had only dribbles of product left. 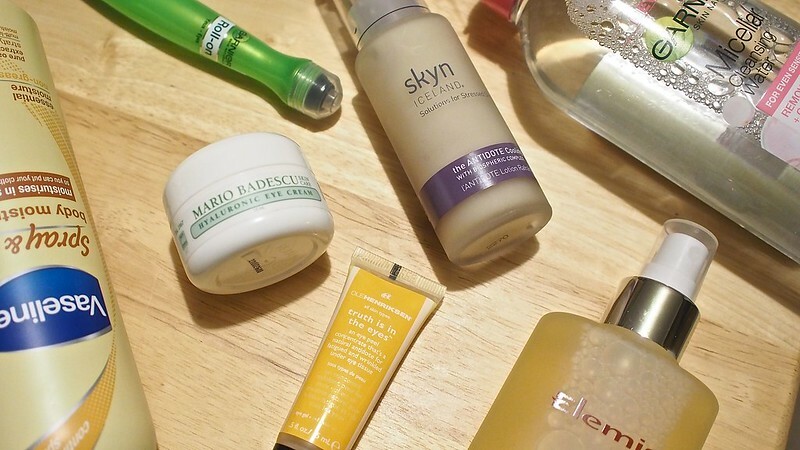 I started scouting around the internet just like I am sure all good beauty bloggers do, trying to see what was getting the positive votes lately, but I eventually decided I would try a few unheard of (to me anyway) products instead. For my toner, I went for the Elemis Apricot soothing toner. I have to admit that first impressions of this aren't great as the smell is a bit funky, more like chemically tampered with apricots than the fresh kind. As it is only a toner I can look past that as I only use a couple of spritzes and it doesn't linger, but I don't think i will re-invest. For make-up remover I ventured away from Bioderma and decided to give a high street micellar water a go. At £4.99 this Garnier offering is significantly cheaper and only 100ml less product than my french favourite, so if it continues to impress me this may become a new repeat purchase. I don't wear huge amounts of eye makeup, and don't use waterproof products so it may not work as well if you do, but so far I am impressed. I suffer from really dry eyes, both my eyeballs and the skin around my eyes, and find that if i forget to apply eye cream even once it dramatically increases the irritation I feel so an intensely hydrating eye cream is what I have been on the hunt for. I tried a few samples of the new Chanel one and loved it but couldn't bring myself to spend £40 so instead I spent literally hours looking all over the internet for an alternative. I found this Mario Badescu one, and was drawn to the hyaluronic claims. On first use it felt amazing, I am not sure this is as good as the Chanel, but we will see if it has any long term impact on keeping that delicate area hydrated. Also for the eyes I picked up an old favourite the Garnier caffeine eye roll on, as I used to find it so great for cooling and de-puffing the eye area. Unfortunately it seems I am too sensitive for this product, at least while my eyes are being especially irritable, so this one will have to sit in the cupboard for a little while, but this was an absolute staple for me for a long time, so I highly recommend it. I also added the Ole Henrikson Truth is in the Eyes Eye Peel Concentrate that I mentioned in my wish list post to my basket, I thought it was meant to be used as an occasional treatment but the packaging recommends using it twice a day. So far I haven't been brave enough to try this to that extent, but I have tried it on my spa sundays and do see a little improvement so maybe I will use it more often. I don't really do body moisturiser, I am really really lazy when it comes to using them, really really lazy! When people started talking about a lotion you could just spray on, get dressed and not worry about your clothes sticking it sounded perfect, so I grabbed the Vaseline Spray and Go the next time I was at the supermarket. I have used it a couple of times, but it hasn't been amazing enough to make me use it every day. I don't know if it is just my can but the spray isn't a mist which was the first surprise, which means it doesn't spray evenly and requires rubbing in. I will give it a few more tries but I am not completely sold. Finally, I needed a new face cream. I really was tempted to grab the Antipodes one I have mentioned before, but then during a trip to my local Marks and Spencer's I discovered they have put in a mini beauty hall, and had to check out the creams there. This Skyn Iceland The Antidote lotion is amazing (and M&S currently has it in the wrong section on their website), I am not sure yet what it is that causes the effect, but when you apply it your skin feels cold, it doesn't just say it soothes, it actually soothes by cooling irritated skin! I have yet to see any more benefits yet, but so far I love it and am definitely going to consider purchasing more products from the brand. Have you purchased any new skincare lately?